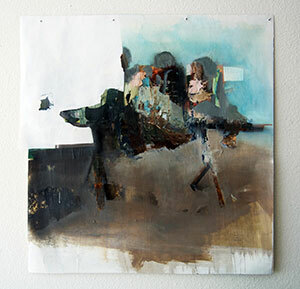 Snyder predominantly works with mixed media materials in a two-dimensional format. Oil paint, spray paint, acrylic paint, ink, plastic and collage are many of the materials and processes employed in her works. She said the Physical/Ephemeral exhibition has allowed her to explore new formats and ideas for her work and has encouraged her to try creating work that she feels questions the boundaries between painting and real space. Snyder is currently an adjunct professor at Montgomery College and Frederick Community College in Maryland. She received her BFA in painting from Ashland University in Ashland, Ohio and later her MFA in painting from Kendall College of Art & Design in Grand Rapids, Michigan. Snyder works at the International Arts & Artists as a grants project coordinator and is also employed at the Glenstone Foundation, a contemporary art museum in Potomac Maryland. The Fisher Art Gallery is located on the second level of Schlesinger Center. The galleries at the Schlesinger Center are open from 10 a.m. to 4 p.m. Monday through Friday and during concert hall events. For more information about art shows and concert hall events, call the Schlesinger Center at 703.845.6156.